formerly Council of Kangs, Kang "prime"
Powers/Abilities: She possesses a gifted intellect, and has at least passing experience with the use of weapons. Unlike the Terminatrix, she abhors violence. It is uncertain whether this Ravonna possesses the same physical abilities of the Terminatrix, which may have been artificially enhanced. Ravonna possesses enhanced speed, stamina, agility, and reflexes, as well as superhuman durability. - Having conquered the rest of Earth in the reality of Other Earth in 40th century, Kang confronted the tiny kingdom of King Carelius, expecting his surrender. Instead Carelius sent out his daughter, the young Ravonna, who laughed at his terms, telling him they would fight him to the death of the last citizen before they would live under his tyrannical yoke. Impressed, Kang spared the kingdom, expanding his empire off of Earth. - Two years later, Kang returned, his empire now stretching one hundred light years in every direction, and he offered new terms: he would spare the kingdom if Ravonna agreed to marry him. Again Ravonna defied him, and their clash of wills had been the clash of flint upon steel, and in Kang's heart was ignited a passion to rival his love of conquest. Kang's powerful armies made it clear that he could decimate the realm at any point, but he allowed Carelius to remain as puppet dictator, hoping to win over Ravonna and have her marry him. - Years later, having conquered the entire galaxy, Kang's patience reached an end. (Avengers I#23 / Avengers Forever#9 (fb)) - Seeking to impress Ravonna, Kang summoned the Avengers so that he could either force them to submit to him or defeat them in front of her. The Avengers resisted Kang and Ravonna refused his claims of earning her hand in marriage by right of conquest. Furious, Kang then vowed to turn their realm to dust. (Avengers I#24) - Kang's armies rapidly overpowered the small realm and the Avengers. However, when Kang tried to claim Ravonna as his prize, Baltag--commander of Kang's elite guard--reminded Kang that his code was that all conquered monarchs must be slain to prevent future rebellion. Kang claimed that his word was supreme and that the rules were his to make and break, but Baltag then led a group of generals to assault Kang, in whom they had seen the first sign of weakness. Kang was forced to flee initially, but he then joined with the Avengersand the free people of Carelius' kingdom (via promising to free the kingdom and Ravonna) to defeat the generals and retake leadership of his armies. Ravonna was truly impressed with Kang risking his life to save her from execution; when Baltag grabbed a careless guard's gun and fired on Kang, Ravonna leapt in his path, taking the blast meant for him. Baltag was quickly executed, but it was seemingly too late for Ravonna. (Avengers I#269 (fb)) - After discovering the seeming remains and former base of Immortus (apparently all part of a plot of Immortus to have Kang clean-up his own divergent counterparts), Kang discovered scores of viewscreens, one of which contained an image of the struggle that had resulted in Ravonna's death. Distraught by the scene Kang groped at the controls, causing a divergence in which he teleported Ravonna to his side, saving her from death, though in that reality, his counterpart met death from Baltag's assault. Kang soon discovered that their was an abundance of divergent versions of himself and he initiated a plot to eliminate them all, despite Ravonna's efforts to turn him from violence. Kang soon formed the Council of Kangs, eliminating the divergents. (Avengers I#269 (fb) - BTS) - However, Ravonna opposed Kang's violent ways and methods. Encountering Immortus, she saw in him all that was ever good in Kang. She supplied him with information on Kang's counter-divergency project. (Avengers I#267) - After the elimination of the last of the remaining divergents, one of the other two Council members, Kang "discoverer", managed to return to the Council chambers, where he was greeted by the "prime" Kang. After showing the "discoverer" around, the "prime" Kang had Ravonna emerge from hiding, distracting the discoverer so that he could be slain by energy weapon. Ravonna questioned the necessity of his murder, of which Kang had no doubt, promising her it would soon be over. Kang later showed Ravonna how he was manipulating the Avengers into conflict with Kang "final counterpart", weakening him so that the prime Kang could eliminate his final competition. (Avengers I#268) - Kang showed Ravonna his robot duplicates, which he was sending to each reality in which he had slain his own counterpart, so he could control those realms as well. Ravonna was appalled when Kang showed her how he planned to use the slain body of the discoverer Kang in his efforts against his final counterpart. Still, she stayed by Kang's side when he captured both the final counterpart and the Avengers. (Avengers I#269) - Ravonna stood at Kang's side as he revealed his origins and motives to the final counterpart and the Avengers. However, tired of Kang's violent ways, Ravonna noticed the stasis beam's strain as Hercules struggled against it, but she said nothing, allowing Hercules to short out the beam and free all of the "prime" Kang's prisoners. 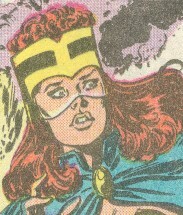 When the "prime" Kang fled, Ravonna sent the other Avengers to capture him, while she held the final divergent at gunpoint. She tried to dissuade him from continuing the cycle of violence, begging him not to hurt his counterpart, but he refused. Exhausted with the Kangs, she let him go free, lamenting their inability to stop the endless killing. She was comforted by Immortus. After the "prime" Kang had slain the final divergent, Immortus revealed himself, his survival and manipulation of Kang, and his alliance with Ravonna. She stood by as Kang stole Immortus' psyche-globe, was temporarily maddened by it, and fled into the depths of Limbo. After Immortus refused to answer all of the Avengers' questions and dismissed them back to their reality, Ravonna told him that they would never trust him, but he revealed that it was better that they be wary of beings like him, rather than becoming complacent and risk losing their effectiveness. (Avengers Annual#21/4) - Ravonna stood by Immortus' side as they watched the Terminatrix, who was frustrated over her recent conflict with Kang, which had resulted in Kang being left in a deathlike state. Ravonna was repelled by her other self's cruelty, unable to believe that she ever could have become like her, a murderous woman living for revenge. Comments: Adapted by Roger Stern, John Buscema, and Tom Palmer. I don't know exactly where in Kang's chronology the Time's Arrow series takes place. He mentions the Council of Kangs in the first part of the trilogy, but then he seems to be imprisoned forever at the end of the series. It either takes place with the "prime" Kang between the end of the Council of Kangs series, but before the Citizen Kang annuals OR, it is yet another divergent Kang, appearing almost anywhere, but presumably preceding Avengers I#267-269. I think since there is only one Immortus, it may be that the Ravonna from the main portion of the profile, who became the companion of Immortus, is the same one as "Ravonna-Terminal." Thanks to Brandon Nash for pointing out her home kingdom. A pseudo-organic creation of the Grandmaster, she was placed in the stasis tube, replacing the Ravonna who would become the Terminatrix, so Kang never knew she was missing. 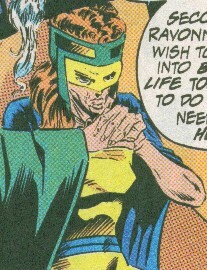 It's fate is unrevealed, but one MIGHT speculate that it could have escaped at some point and COULD be the Grandmaster-looking Ravonna seen in Avengers: Terminatrix Objective#2+3. She ruled her kingdom with authority and respect and had never met Kang. From Limbo, Kang searched through countless realities until he found her. He intended to woo and marry her, and eliminate all other realities from existence using power accrued within his "Time's Arrows" via his manipulations of the X-Men and Spider-Man. 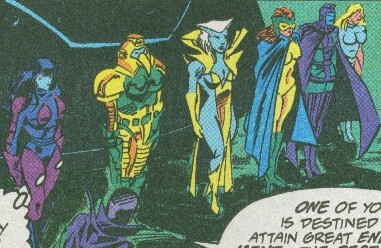 However, in Kang's rush to transport his Force Shield Generator to her reality, he unwittingly transported a trio of X-Men to her realm as well. While Ravonna's soldiers captured the X-Men, Kang was infuriated at their "interference" and rushed in to stop them. He told Ravonna that he had come to save her and her realm from the marauding X-Men. However, when Gambit broke free from his manacles, Kang rushed to stop him, and Ravonna, furious over the chaos in her court, rushed to stop to Kang herself. 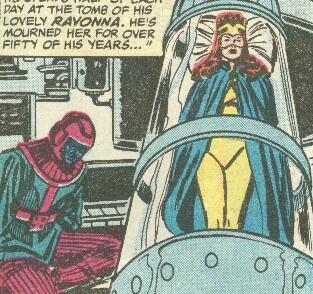 As Kang fired on Gambit, he instead struck Ravonna, slaying her. Devastated at this turn of events, Kang surrendered to her guards, who stripped him of his armor and imprisoned him in a cell for all eternity. And Kang lay within the cell, responsive to nothing and no one...because nothing and no one mattered to him any more. The counterpart associated with the final divergent Kang, she was last seen in stasis, where she had been mourned by him for fifty years. One Ravonna is clearly patterned after Nebula, the space pirate whom the Terminatrix Ravonna had impersonated while in the Council of Cross-Time Kangs. It is possible--though entirely speculative--that, given that Nebula's penchant for espousing differing origins, that in one reality, the future Terminatrix Ravonna continued her identity as Nebula and actually is/was the space pirate first seen in Avengers I#257. Or not. Another was the Terminatrix, in her battle armor. Another was clearly patterned after the Grandmaster. Another divergent Ravonna, feeling gratitude towards her savior, may have become a closer associate or even lover of the Grandmaster, adopting his physical properties to some degree. Another wore the garb of Princess Ravonna in her original form. It might more likely be the Ravonna who had been saved by the prime Kang...the one featured as the primary entry above. Another was garbed in Kang armor, the same version worn by the Terminatrix while impersonating Kang as ruler of Chronopolis. It could also be a divergent of the Terminatrix Ravonna, one who would chose to remain as ruler of Chronopolis rather than ever revive the true/prime Kang. The lover of Immortus at the end of his days, she and he remained deeply in love; he described her beauty as shining with a radiance that not even time could dim. She moved about via a floating life support chair, and she wished to pass into beyond-life together with Immortus, so he arranged the means so that another would terminate her life functions at the instant of his death. As Immortus fell, he told her that his love for her is eternal, transcending the trappings of the flesh. The Terminatrix completed the agreement, terminated Ravonna's life support as she wished.